I've been on this "must make hair flowers" tangent, but I have learned some new techniques as well as accumulated over 12 flowers for my hair. Hey, work hard, look pretty. These are some that I made in the last few days. Black Lotus with silver skull and bones design. I used black acrylic paint to make the white petals and green pad leaf black. I used a silver paint pen (very stinky, but pretty) to draw the design as well as paint the button (well, for the button, I made a pool of the paint on wax paper and used a fine pant brush to paint the button). 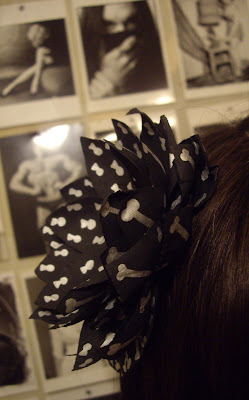 It is hand sewn together and has a black alligator clip on the back. My mom actually really liked this one, which as a nice surprise as she doesn't always like my work. The tops of the petals are skull print and the bottoms are bone. This angle shows it better. I used black acrylic paint to turn the dark red Dahlia, black). 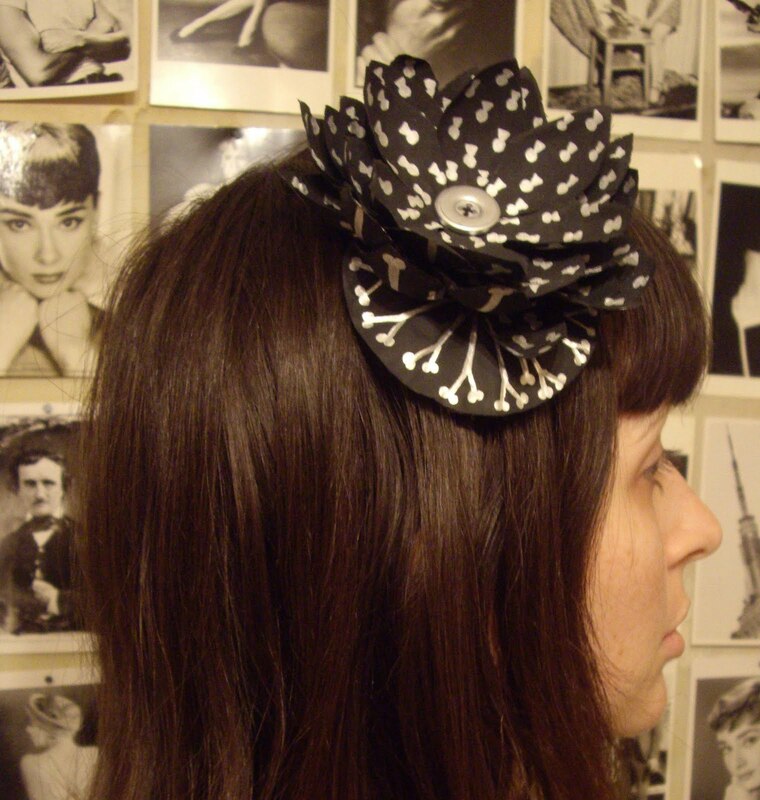 It is hand sewn together with a black alligator clip on the back. I made this flower this morning. This was one of the easier flowers because poppies only have 4 petals and this fake flower, like most, had two petals per layer. I've loved Poppies ever since I saw (then, read) "The Wizard of OZ". I was sort of sleepy still while making it, so I guess it's an appropriate flower to make at the time. This is hand sewn together with a black alligator clip on the back. We'll call this "The 80's Flower"
I made this at C-MoR (Children's Museum of Richmond) on Saturday while my daughter was making something. I let her get her supplies. Then, I cruised the supplies and found all this sheer brightly colored and leopard fabric. I couldn't resist making a flower from it. I layered some pieces of fabric together, accordian folded it, secured it with a small pipe cleaner and then fluffed the pieces on the sides to make the flower full. I made a total of 3 flowers using this easy technique and twisted the pipe cleaner ends together. I thought it needed some leaves too (which you can't see in this photo), so I folded some light green fabric into two triangles, laid them on the twisted pipe cleaners and secured them with another small pipe cleaner. I put the end of the flower stem (all those twisted pipe cleaners) into a button hole of my cardigan and wore it around. I think I am helping the 80's look by wearing this zebra print dress (which is ankle length). I love making these random things.